For many years, KDDI Evolva has supported multilingual communication linking Japan and other countries. Underpinning the core of its business lies an untiring desire to satisfy all its customers. As many as 2,000 Jabra headsets have been introduced at KDDI Evolva's call centers which provide a high volume of communication support every day. Staff members at KDDI Evolva reported many complaints about the headsets that they used to use. We heard from the people who routinely use headsets about the improvements they have experienced since starting to use Jabra BIZ™ 2400 Mono NC. "The headsets we used to use had a lot of noise and the sound quality wasn't very good. They also picked up a lot of background noise and this presented a risk of complaints." "One of the requirements for a good call center is giving a good impression from the very first word"
The sound quality issues were the first thing pointed out by Mr. Sato, a supervisor in his seventh year with the company. In call centers, where there are a lot of people sitting side by side, noise-canceling performance has a huge impact on the quality of call handling. "People were also dissatisfied with their durability. The connector attaching the headset to the microphone was very fragile, so we used to reinforce it with adhesive tape. Even brushing a severed point lightly would produce a rasping noise that would be picked up by the microphone. Robustness is one of the things required of headsets by heavy users. Repair costs for products that frequently break cannot be ignored. "Hygiene was also an issue with the sponge tip on the microphone. The hygiene aspect was the third most common complaint among the operators using headsets. In this sort of environment, with lots of people coming and going on different shifts, it's difficult to provide everyone with an individual headset. Failure to create an environment that enables operators to work comfortably impacts on the way staff interact with customers." Mr. Sato says that customer satisfaction also depends on how comfortable the working environment is for the operators assisting them. So how did Jabra products improve on this array of problems? 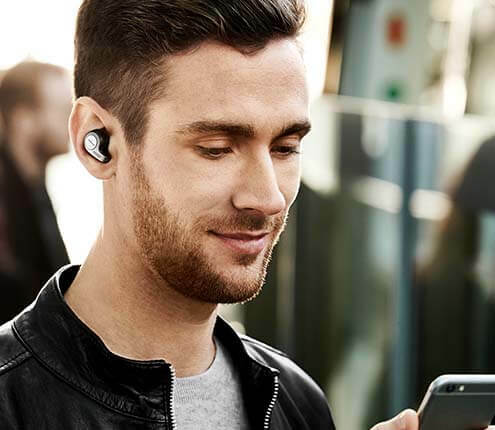 "When we introduced Jabra BIZ 2400 Mono NC, there was an astonishing amount of positive feedback from our operators about the headsets. I use them too, and they're really light and flexible. We don't have any problems with them cracking or breaking." A carbon-based material has been used to make the Jabra BIZ 2400 more lightweight. The neckband features material commonly used in medical equipment, so they have a robustness that ensures they can withstand heavy use. In addition, because the design takes the center of gravity into consideration, the headsets do not feel too tight and sit lightly in position. They boast a high level of durability, since they return to their original shape even if you bend them quite a long way and the structure prevents the wire snapping. "As far as the hygiene issue is concerned, the microphone is made of plastic, so it's easy to wipe it to keep it clean. That's something that the operators really appreciated." Mr. Sato was also kind enough to tell us about Jabra's excellent support system. 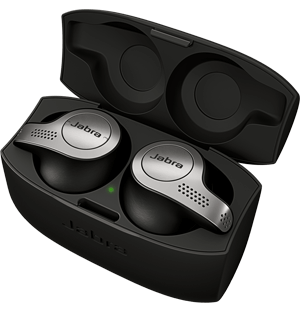 "Jabra products have a very long warranty period, so you have peace of mind even with heavy use. As a result, we find them to be very cost effective. That's because many of the headsets we used before broke and we had to buy new ones each time. So our running costs have improved tremendously. We've had 120 Jabra BIZ 2400 Mono NC headsets in my department for just under two years and hardly any of them have broken during that time." The combination of durability and support is why Jabra BIZ 2400 Mono NC has won the trust of KDDI Evolva. "The most important thing is not to inconvenience the customer on the other end of the line. Accordingly, improving the quality of the operators assisting them is crucial. I believe that one of the requirements for a good call center is giving a good impression from the very first word. If the first voice they hear is crystal clear, the customer will feel that they've reached the right person. We want to continue working on developing an environment that allows the customer to hear our operators comfortably." KDDI Evolva is striving to satisfy all of its customers. Chosen to enhance its call center capabilities, the Jabra BIZ 2400 Mono NC is a product with the right qualities to support that goal. This kind of feedback from the front line has shown us that the rapidly-changing world of network business is one of the environments in which Jabra's essential qualities really come into their own. KDDI Evolva started as a KDDI International Call Center in 1953 and for more than 50 years, it has been supporting communication in Japan and overseas. With the background, KDDI Evolva has expanded its business from call center operation to a temporary staffing agency. Currently, it has become one of the top call center outsourcers in Japan. In order to continue to respond to rapid changes, KDDI Evolva aims to deliver impression, peace of mind, happiness, and smiles of appreciation to people throughout the world by providing the service the customers truly desire, taking to heart the motto of “more friendly, more global, and more diverse values”. As a dedicated contact center, KDDI Evolva needs reliable, durable and superior sound quality headsets. Inferior sound quality, especially the lack of noise cancellation, has led to serious complaints. In addition, many agents apply adhesive tape to maintain the headset shape and this has led to frustration with the headset that impacts on daily work.